Notes: I discovered this little gem hidden in the back corner of the liquor store. The secret to Kopper Kettle is that it is made in a genuine 1930’s era copper pot still in the same fashion that fresh corn whiskey was distilled at the time of our ancestors. 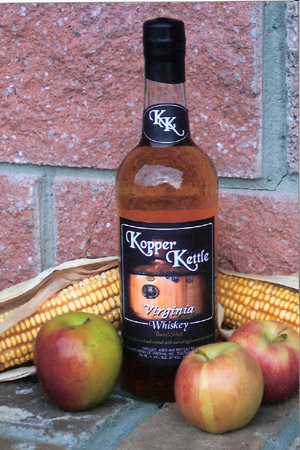 Just think of the founding fathers getting ripped on Virginia Whiskey and shouting “RULE NUMBER TWO, GUNS FOR EVERYONE!” Kopper Kettle is a triple grain whiskey (corn, wheat, and barley), double wood, and twice distilled. If you are crafty in the ways of creating BBQ sauces, this would be a prime candidate to use, and we at BourbonBlog.com would love to hear your recipe if you were to come up with one! Color: Pale honey with the tiniest hint of amber. Nose: Very sweet, the apple wood is strong almost overpowering any other smell you could gain. Taste: Oak and Apple wood are very prevalent in this whiskey giving it a very sweet taste. There is only the lightest twinge of spice when it first hits your lips. Finish: Incredibly smooth aftertaste, there is a bit of a tingle that follows at the end, but very pleasant.